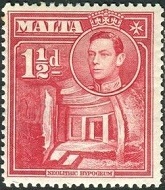 For Malta stamps, the big events of this time period were the coronation of King George VI and Queen Elizabeth in 1937, and the introduction of a brand new series of engraved pictorial definitive postage stamps in 1938. With very few exceptions, all the definitive postage stamps issued since 1938 have either been wide-format or tall-format pictorial stamps, though they still have the profile of the monarch integrated somewhere into the designs. 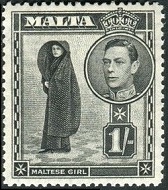 A greater number of commemorative Malta stamps also began appearing during the reign of King George VI and continued into the reign of his daughter, Queen Elizabeth II. 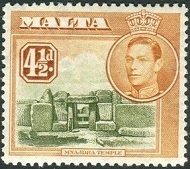 The three Malta stamps shown above (Sc. #188-90) were issued on May 12, 1937, the day of the Coronation of King George VI and Queen Elizabeth, formerly the Duke and Duchess of York. 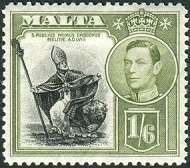 These Malta stamps are engraved, and perforated 13 1/2 x 14. 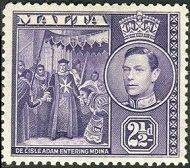 The designs of these coronation stamps feature the facing portraits of the king and queen, with coronation regalia around. 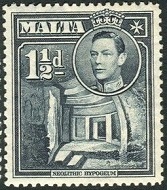 The twenty-one pictorial definitive Malta stamps, shown directly below, were all issued in 1938, with new colors for the lower-denomination stamps being added in 1943. The following Malta stamps are separated into small groups, with the attributes and historical descriptions, where appropriate, following each group. Pictorial vignettes that have been historically described in previous pages of this website category, will not be described again here! Please refer back to the previous pages for those historical descriptions. 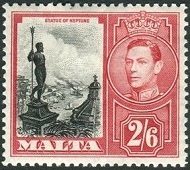 1/4 P. (1938 - Scott #191) - Valletta Harbor. 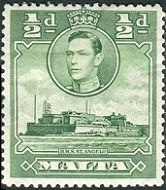 1/2 P. (1938 - Scott #192) - Fort St. Angelo. 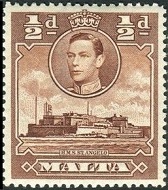 1/2 P. (1943 - Scott #192A) - Fort St. Angelo. Fort St. Angelo is a fortification in the center of the Grand Harbor in Birgu, Malta, constructed sometime before the 13th Century. Originally called Castrum Maris (Latin: the Sea Castle), the fort was rebuilt by the Order of St. John and renamed to Fort St. Angelo during the 16th Century. The fortress, in 1530, became the seat of the Grand Master of the Order of St. John of the Knights of Malta. 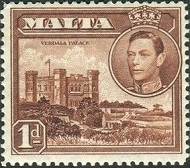 1 P. (1938 - Scott #193) - Verdala Palace. 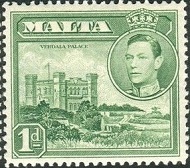 1 P. (1943 - Scott #193A) - Verdala Palace. Verdala Palace was the official Summer residence of the Governors General of Malta during British rule, and is the official Summer residence of the Presidents of modern Malta. It was built in 1586 by Grand Master Hugues Loubenx de Verdalle (1531-1595) on the site of a hunting lodge previously owned by Grand Master Jean Parisot de Valette (1495-1568). The grounds around the palace were often used by the Knights of Malta for game hunting. 1 1/2 P. (1938 - Scott #194) - Neolithic Temple Ruins. 1 1/2 P. (1943 - Scott #194A) - Neolithic Temple Ruins. 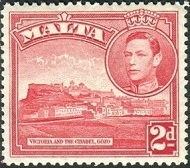 2 P. (1938 - Scott #195) - Victoria and Citadel, Gozo Island. 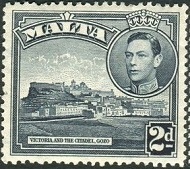 2 P. (1943 - Scott #195A) - Victoria and Citadel, Gozo Island. The Citadel is a fortified city that is situated in the heart of Victoria, Gozo Island. The area was first fortified around 1,500 B.C. and development continued under the rule of the Phoenicians. During ancient Roman rule, it became a complex acropolis. The fortifications were overrun and destroyed by the Ottomans in 1551, but parts of the Citadel were later rebuilt by the Order of St. John in 1603. The fortified walls and the Southern part of the old city, where the cathedral is located, are still intact, but the Northern part of the old city is still in ruins. Restoration is ongoing. 2 1/2 P. (1938 - Scott #196) - De L'Isle Adam Entering Mdina. 2 1/2 P. (1943 - Scott #196A) - De L'Isle Adam Entering Mdina. Philippe Villiers de l'Isle-Adam (1464-1534) was a member of the Knights Hospitaller of Rhodes and later of Malta. The Knights Hospitaller evolved into the Order of St. John, and again evolved into the Sovereign Military Order of Malta, or the Knights of Malta. He was elected the 44th Grand Master of the Order of St. John of the Knights of Malta in 1521. 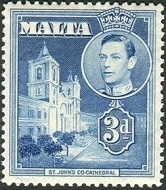 3 P. (1938 - Scott #197) - St. John's Co-Cathedral. 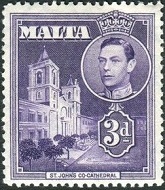 3 P. (1938 - Scott #197A) - St. John's Co-Cathedral. St. Johns Co-Cathedral is located in Valletta, Malta. The cathedral was built by the Knights of Malta, between 1573 and 1578. 4 1/2 P. (1938 - Scott #198) - Megalithic Temple at Mnaidra. 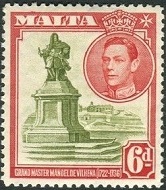 6 P. (1938 - Scott #199) - Statue of Antonio Manoel de Vilhena. Antonio Manoel de Vilhena (1663-1736) was a Portuguese Prince and the 66th Grand Master of the Order of St. John of the Knights of Malta from 1722 to 1736. His statue stands in Pope John XXIII Square in Floriana, a suburb of Valletta, which he built as a charitable gesture to the Maltese people. 1 S. (1938 - Scott #200) - Woman in Faldetta. The Faldetta was a hooded cloak once worn by women of Malta and Gozo. 1 1/2 S. (1938 - Scott #201) - St. Publius. 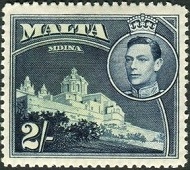 2 S. (1938 - Scott #202) - Mdina Cathedral. St. Paul's Cathedral in Mdina is a 17th Century cathedral that stands on the traditional site where governor Publius welcomed Saint Paul following his shipwreck off the Maltese coast. 2 1/2 S. (1938 - Scott #203) - Statue of Neptune. 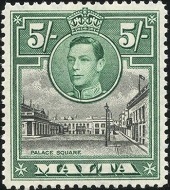 5 S. (1938 - Scott #204) - Palace Square. Palace Square is the square in front of the Grand Master's Palace in Valletta. The palace was originally built as the home of the reigning Grand Master of the Order of St. John. During the British colonial period, it was the residence of the Governor General. Today it houses the offices of the President of Malta and the Maltese House of Representatives. 10 S. (1938 - Scott #205) - St. Paul. 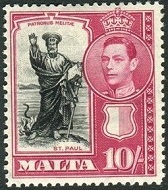 The two Malta stamps shown above (Sc. #206-07) were issued December 3, 1946 to celebrate the Return to Peace at the end of World War II. The designs feature a view of the Thames River in London, with the Parliament buildings in the distance. All of the stamps of King George VI were printed on paper with WMK 4 - the Multiple Crown and Script CA watermark, as shown in the image above.